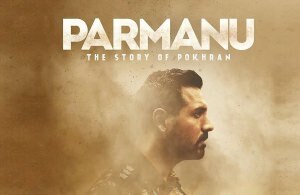 PARMANU – THE STORY OF POKHRAN is the story of those people who secretly carried out a series of nuclear bomb test explosions in Pokhran on May 11, 1998. Ashwath Rana (John Abraham) is from the research department of the Central Government and in 1995, he advises the Prime Minister’s Office to conduct nuclear bomb tests in order to achieve supremacy in this field and establish fear among the nuclear powers of the world. The plan gets accepted but he’s not made a part of it. His plan is also not studied well. As a result, USA’s satellites catch India preparing for the tests red handed. India is left red faced and Ashwath is made the scapegoat. He is removed from his job and shifts to Mussoorie with wife Sushma (Anuja Sathe) and son Prahlad.